This week Jess from French Toast Sunday has our third entry in our month of animated scenes! Like many young girls growing up, I watched a lot of Disney movies. 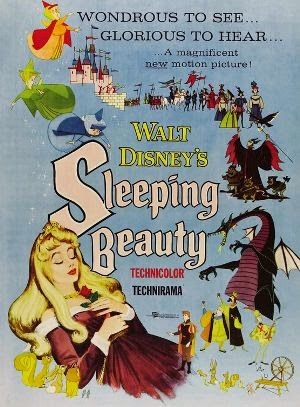 Probably my favorite of all the classic Disney movies was Sleeping Beauty. I loved the hidden princess Aurora, the beautiful song “Once Upon a Dream”, one of Disney’s darkest villains Maleficent, gorgeously detailed animation, the silly comedy parts, and the exciting action sequences (I was in elementary school guys…). Part of me wanted to go with the adorable meet cute between Aurora and Prince Phillip where they sing the film’s main theme together. Another great one is one of Disney’s scariest sequences when Aurora enters the secret passage in the castle and finally pricks her finger on the spindle. However, I bypassed the romance and horror to showcase a funny scene instead. One of my favorite moments comes from the three good fairies who take care of Aurora deep in the forest. To keep the princess safely hidden from Maleficent they haven’t used magic as to not draw attention. On her sixteenth birthday they decide to break out the wands because baking, sewing, and cleaning is just too darn hard for three fairies that have been doing it for over a decade. First of all, this scene starts with some ridiculous attempts at all of these things. The dress is hideous, the cake is some nasty dough, and that cottage hardly looks presentable. It’s all really silly, but it still makes me laugh when Fauna reads “Two eggs – fold in gently” and literally puts two whole eggs into the mix. It would all be cute enough, but then the magic breaks out and things just get more goofy, when Flora and Merryweather start fighting over the colors of Aurora’s birthday dress. It all takes a darker turn. Okay, maybe this all would be a lot more entertaining if you were me at 6 years old, but I still think it’s quite the cute scene and gives me a healthy dose of nostalgia.